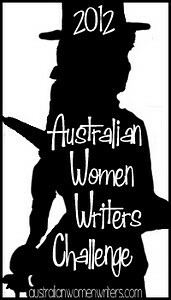 I have completed the 2012 Australian Women Writers Challenge! The sixth Corinna Chapman mystery. While a fun read, I did not enjoy this quite as much as earlier books in the series. From a mystery point of view, I was unsatisfied with parts of the ending. From a social point of view, there was a problematic approach to a trans* character, including transphobia expressed by a couple of characters with whom the reader is intended to sympathise, and whom the main character likes. I did not particularly enjoy this book. While the plot and story were pretty good, I found the main character irritating much of the time, the dialogue clunky, and the ending both entirely predictable and too rushed when it happened. An enjoyable read, and a good way to learn about some parts of Australian society around the turn of the twentieth century, but without a lot of depth for a modern reader. A valuable background to Germaine Greer and her writing; especially useful in light of the contemporary media’s habit of asking Dr Greer for “feminist” commentary. I enjoyed this book greatly, for Ms Westwood’s solid writing, her well-imagined dystopian near-future Melbourne and her use of trans* and genderqueer characters. However, as a mystery, it is a touch too predictable with a few too many coincidences. Many readers, like myself, will thoroughly enjoy it despite this, but mystery-lovers should be warned! Sublime. I should read more poetry more often, especially when it is this good. I was a Franklin-fantastic Devoted Eclectic. This means I committed to read at least 10 books, in as many different genres as possible, and to write at least 4 reviews, including at least one substantial one. (2) No books I have already read (although I am allowed to read books by authors whose other books I have read before). (3) No repeat genres (sub-genres count as separate genres for this purpose). (4) At least three substantial reviews. (5) At least two Aboriginal or Torres Strait Islander authors (h/t lauredhel for this idea). (6) At least one immigrant (or first-generation-Australian) author (in practice, it may well be more than this, given Australia’s immigrant history). (7) At least one book set in a rural setting. (8) I’m not starting until 1 January 2012 (this is a real challenge – I always do a lot of reading between Christmas and New Year, and this year has been no exception – and so I have held off reading some books I really want to read for the purpose of the challenge). (9) I aim to finish the challenge by the end of February. First: as you can see, there are 10 books, from different genres, and I posted four substantive reviews (linked above, also see my series page for a full list of my reviews). In addition, I wrote at least a one sentence review for each of the books. (1) There were no repeat authors. (2) I had not read any of the books before. In fact, Kerry Greenwood and (a few poems by) Judith Wright are the only authors on this list whose work I had read before. There were a few books I have been meaning to read for years, so I was happy to have the incentive to read them, and kind of glad I hadn’t read them before so I could read them for the challenge. Win-win-win! (5) Anita Heiss and Alexis Wright are Indigenous Australians. Dr Anita Heiss is a member of the Wiradjuri nation and Alexis Wright is member of the Waanyi nation. (6) Alice Pung is a first generation Australian. Some of the others might be, but I’m not sure. The aim of this criterion is for cultural diversity, and so I was also on the lookout for non-Anglo names generally (which is how I found Jessica Au). I found it much harder than I had assumed I would to find any Australian women writers with non-Anglo names. This is telling. (7) We of the Never Never, Carpentaria and Cargo are set in rural settings, as are some of Judith Wright’s poems. The Getting of Wisdom is partly set in a rural setting, but it’s not really the point of the book. (8) & (9) both done. Thanks again to all those who set up this challenge, especially Elizabeth Lhuede and Shelleyrae of Book’d Out. The fact that I finished the challenge well before the end of January confirms what I said in my sign-up post: this was not a big challenge for me. I already read a lot of books by Australian women writers, I read fast, reading is my favourite way to relax, and, as I am on holidays at the moment, I have had a lot of reading time. That is why I added the extra criteria, and I’m glad I did. The extra criteria meant that I did something other than simply read the books I would otherwise have been reading. In fact, just about every book I read for the challenge was one I specifically bought for the challenge. In the end, I read much more non-fiction than usual (I do not usually read much – I need a good story, and too much non-fiction spends too much time “telling the truth” (ha!) rather than “telling the story”), and I read a number of books I have been intending to read for a while. Further, the biggest aspect of the challenge for me was, and was always going to be, writing reviews. This is not something I normally do, and not something I consider myself very good at. However, not only did I write the four substantial reviews which have been posted here at Hoyden About Town (and cross-posted at Wallaby), but I also wrote a brief review for every book, which you can find at my Goodreads page. In keeping with all this, and the purpose of the 2012 Australian Women Writers Challenge in general, during the rest of 2012, I intend to continue to read books by Australian women writers (well, I would anyway), to continue to seek out books that I would not normally read, and to write reviews – and I will aim for a proportionate number of substantial reviews (ie around 40%). Once again, the last part of that will be the most challenging. Substantial reviews will continue to be posted here and at Wallaby, and all reviews will be accessible via my Goodreads page. You can see my full list of books here. You can find a full list of my reviews, and other posts relevant to the challenge, here. I’m glad I wanted to leave a response here, because it meant that I noticed you had accidentally closed comments, and I fixed it! I’m looking forward to doing the challenge a little bit later this year. February/March, I’m expecting. Will have to sort out my own guidelines, will definitely be poaching some of yours. Thanks TT – I’m also glad you picked up my inadvertent attempt to shut down discussion. I’m looking forward to seeing your criteria and reviews, too. Elizabeth Lhuede pointed out in comments over at my place that I had left out any kind of QUILTBAG criterion, so that’s another suggestion, too. I would never have guessed you don’t consider yourself good at writing reviews – it certainly didn’t show in the finished products!